"Seafood seasoning is used to make a marinade that gives these grilled pork chops the delicious flavor of the Chesapeake Bay. More seafood seasoning can be sprinkled on at grill time to provide an extra kick." Whisk together the vegetable oil, apple cider vinegar, seafood seasoning, minced garlic, basil, lime juice, and black pepper in a bowl, and pour into a resealable plastic bag. Add the pork chops, coat with the marinade, squeeze out excess air, and seal the bag. 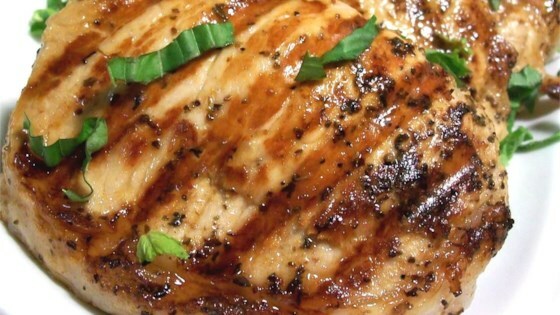 Marinate in the refrigerator for 4 to 6 hours, flipping periodically. Preheat an outdoor grill for medium-high heat, and lightly oil the grate. Remove the pork chops from the bags. Discard excess marinade. Grill until the pork is no longer pink in the center, 5 to 7 minutes per side. An instant-read thermometer inserted into the center should read 145 degrees F (63 degrees C). Loved these! But we love Old Bay so of course we loved these. I couldnt grill these so i baked them in the marinade @ 350 for 40 mins. I will be making these again. Thanks! Wonderful flavor. My family loved this and already asked about the leftovers. I did use 1/2 the amount of vinegar this recipe called for and also used double the Old Bay seasoning. Perfect! Weak on the Old Bay flavor, and very strong on the vinegar. On the plus side, they were tender. Other than that, not much to recommend them, unless you're very fond of vinegar.